Sherwood Park has a new restaurant. Well, kind of new. Tom Goodchild, who opened his first Sawmill restaurant in 1976 in Edmonton, has added to his chain by setting up shop in the space where Franklin’s Inn restaurant operated for years. The interior has been modernized with new lighting, carpet, paint and a water wall, and the menu too has been updated (somewhat) although the old standards are still offered: escargot, Caesar salad, steak and lobster, prime rib and the crowd-pleasing salad bar with the expected macaroni mixtures, pesky peel-and-eat shrimp and orange and blue Jell-O squares which I suspect are a tribute to the Oilers when they, like the Sawmill, reigned surpreme and untouchable…in the 80s. 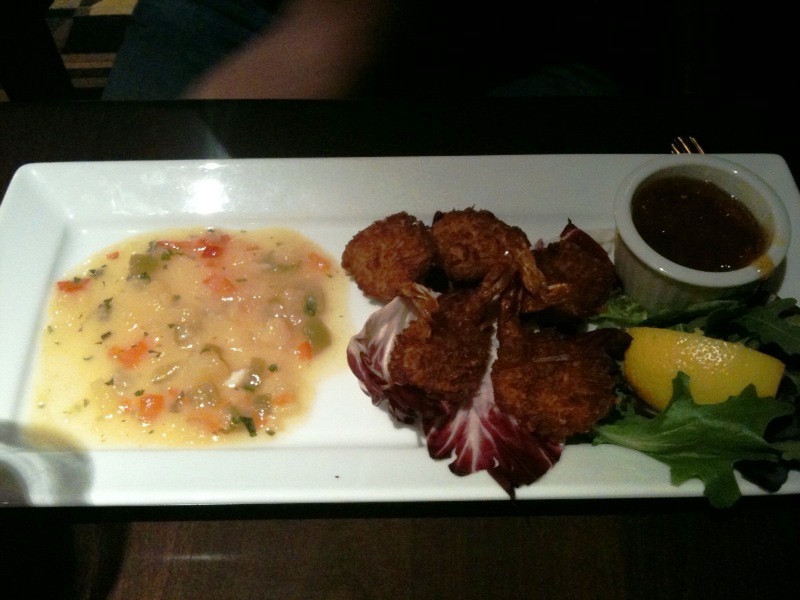 two smooth, perfectly shaped glistening balls of pureed crab and cream cheese sat on my plate beside a deflated handful of greens, and the coconut shrimp, deep fried beyond belief looked curiously mass manufactured beside an unappealing puddle of pineapple salsa. I ordered the steak and lobster special along with a side of béarnaise sauce—if you’re going to revisit the 1980s you might as well go all the way, right? At this point, Steve and I were laughing at pretty much everything. 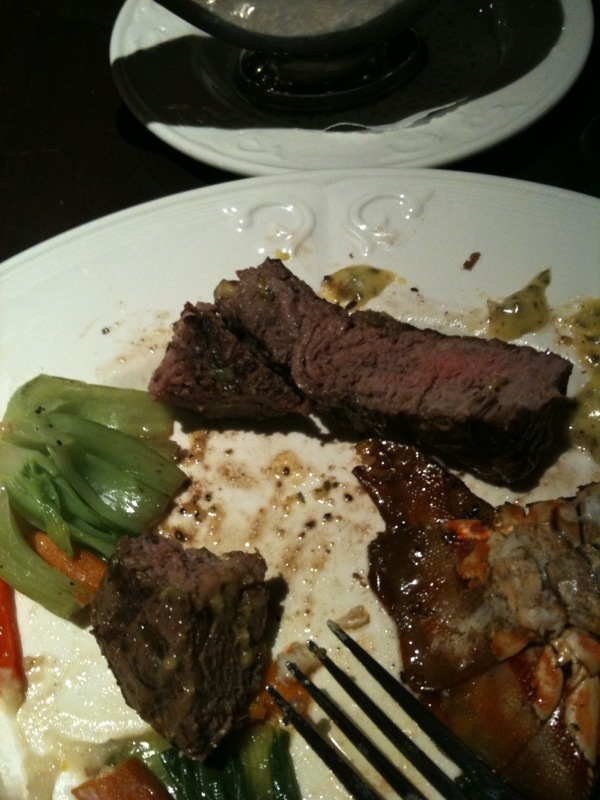 That is, until I cut in to my steak (which I requested medium rare). Over by the wall, our server and a man in a suit were in deep discussion. The man in the suit turned out to be the general manager who came to our table inquiring about our evening. Besides apologizing for the conduct of the young manager, he set the record straight: The appetizers are frozen and bought from a supplier. 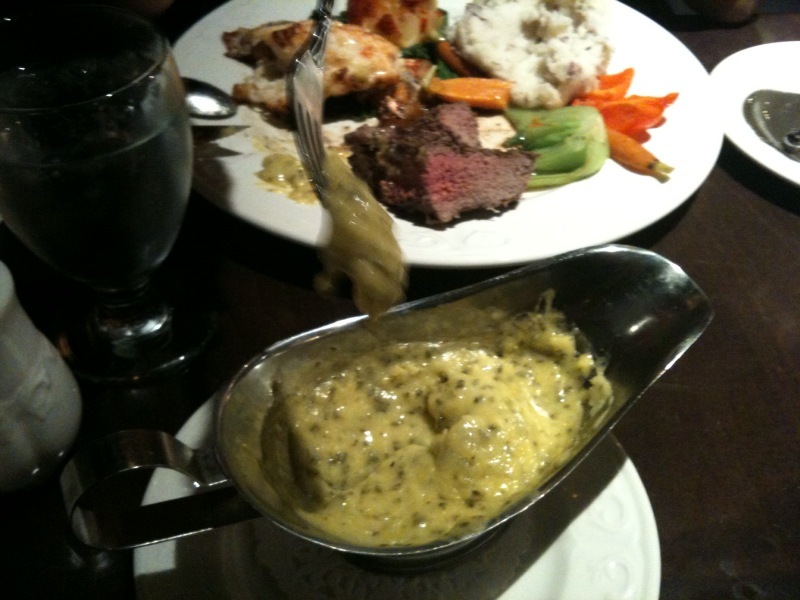 The béarnaise sauce is a powdered mix and yes, my steak was completely overdone. He was very gracious and offered us a $60 discount on our $95 meal along with a customer loyalty card for future visits. He did all the right things I suppose, but it’s never the money that’s the issue. The issue was that the staff, from servers to managers—and evidently the chefs—don’t realize that opening packages and pouring the contents into a deep fryer or a saucepan to mix with water, doesn’t constitute “made from scratch”. So, sad to say, The Sawmill joins the ranks of mediocre restaurants that Sherwood Park seems to attract as there will always be a niche for restaurants that cater to patrons unconcerned about–and unwilling to question–where their food comes from. Like many satellite communities, Sherwood Park, suffers from the Curse of the Burbs when it comes to food offerings. Our Sawmill server, who did the best she could with the information she received, was left a sizeable tip, but as for the customer loyalty card, we left it behind because taking it would imply we’d return, and I don’t think there’s a chance of that ever happening again. Twyla, while I appreciate your clear review of the Sawmill, I was rather disappointed in your blanket categorization of restaurants in the Park. Salvatore’s has a fresh and interesting menu, Saigon cuisine has excellent Vietnamese, and while the Taste of Indian and New Asian Village have predictable buffet offerings, the food is always fresh and very tasty. Costco sells better striploin than most places… maybe you might want to expand your tastes before your judgements. Thanks for the comment, Keefertrace. As far as expanding my tastes, well…I’m not sure I can expand my tastes any more than I have. Except for New Asian Village (I’ve been to their other locations but not the one in the Park), I’ve eaten at every restaurant in Strathcona County and stand by what I said about the area seeming to attract mediocre restaurants. That being said, Taste of India is probably our favourite place in the Park to eat. As far as Salvatore’s goes: I take it your experience there was better than my family’s experience when they first opened. Lacklustre, poorly prepared, salty food…maybe they’ve improved? I hope so. The potential is there. You might think Saigon has excellent Vietnamese food, but I don’t (excellent is a pretty loft standard to achieve and attain), and that’s okay. Sherwood Park’s Costco was selected as a test location to carry Canadian Prime Beef, a designation given to less than 2% of graded beef in Canada. How we got so lucky, I’m not sure, but I’ve tried it, and it blew my mind. I would still prefer though to spend my money at independent butcher stores like the Butcher Block in Sherwood Park, or Real Deal Meats in Edmonton—two places where people like Shaun and Darcy know how to properly dry age meat that comes from local producers. 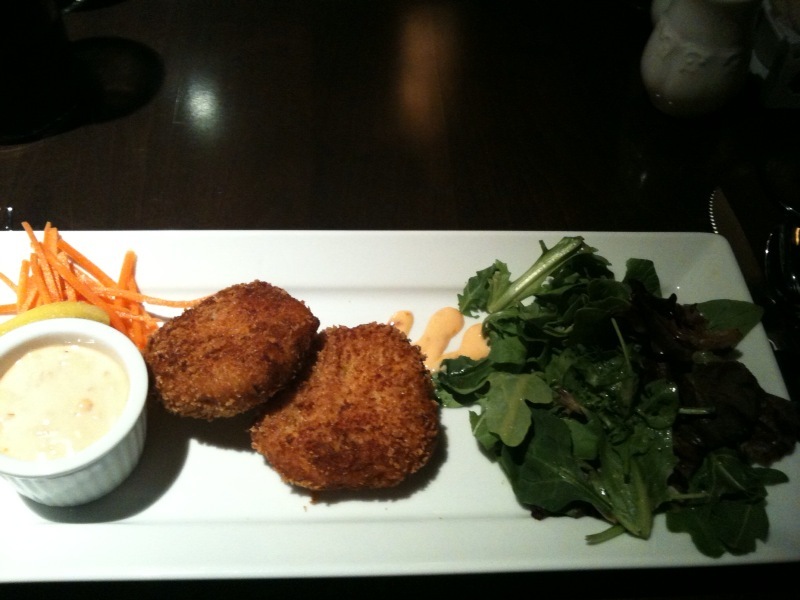 I still believe that Sherwood Park has a plethora of mediocre restaurants. Taste of India is not in that category, thankfully. Same with Matsuya (Japanese) and the Ruamit Thai restaurant (great food, debatable service) but those are exceptions and not the norm. Considering that Strathcona County’s overall median income is well above provincial and national medians (Strathcona County Family & Community Services Report 2010) I’m perplexed why we can’t draw more restaurants of calibre like Culina or the Blue Pear, but I’m an optimist…maybe someday. Couldn’t agree more, the Sherwood Park Sawmill was a dump and disappointment. It reminded me of an overpriced Denny’s. See my reviews on Ubrbanspoon and Yelp. You were lucky to get a credit, my $200 for three people was flushed down the toilet; or placed in the salad bar for the flys to eat. Someone should advise the health inspectors to pay this place a visit. I know its a little late to comment, but couldn’t agree more on the state of fine dining in the Park.Its frustrating to have to drive into the city for local well prepared food.Great blog, just discovered it .. can’t wait to try some of your picks. Iagree about the sawmill, it is a dump. But Twyla i think Sherwood Grill and the Rics grill in the park have really good food.Demaggios is ok to.